Everyone enjoys chili peppers. There are so many different kinds and they are used in so many different recipes. Between jalapeno, paprika, cayenne, serrano and ancho, not to mention your average mild peppers, you can grow chili peppers in a variety of types, sizes and colors. 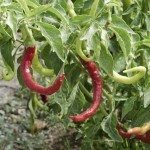 If you have ever thought about how to grow chili peppers, you might find that it really isn’t much different than your regular green or red peppers. Growing chili peppers is easy because they require the same things that your other popular vegetables require because peppers are actually in the same family with eggplants and tomatoes. Growing chili peppers is done best when the temperature at night reaches and maintains itself between 60 and 70 degrees F. (16-21 C.). During the day, a temperature maintaining itself between 70 and 80 degrees F. (21-27 C.) is ideal. You do not want to transplant your indoor starters until then. When you grow chili peppers, you need to realize they take a little time to mature. If you put your transplants outside too soon, they won’t blossom. Without the blossoms, growing chili pepper plants are nothing more than foliage plants because they cannot grow the fruit. Because they are related, you can plant them among tomato plants. Knowing that tomatoes are a hot temperature plant, you should also know that chili peppers will appreciate the warmth as well. Before you put the transplants into the ground, make sure you fertilize the soil fully and work it well. Also, transplant the chili peppers on a cool, cloudy day. This helps prevent wilting and shock. If your plants still wilt, make sure to water them so the ground is somewhat soaked so they can revive themselves. You can pick the chili peppers about 45 to 55 days after you see them bloom. Feel the growing chili peppers and see if they feel thin or if they feel as they should. Another clue is the color of the pepper. If it is supposed to turn orange, is the pepper orange? Should it be green and it’s turning red? This could mean you allowed it to stay on the plant too long. You will know when to pick chili peppers by these simple clues.